Councillor Marie Boulton with co-leaders Douglas Lumsden and Jenny Laing at Marishal College. A new report has painted an improving picture of Aberdeen’s economy- but has called for “flexibility” over new powers to be devolved to the council. Last year, city council chiefs hired an expert panel made up of economists former RBS economist Stephen Boyle, Dr Hannah Morsy and Douglas Peedle to examine the future prospects for the city. Yesterday the group launched their report at the inaugural State of the Cities Conference at the AECC in Bridge of Don, with the picture broadly optimistic. There is a “potential” for the city’s economy to return to “moderate” growth in coming years. Unemployment in the city fell from 3.8% to 2.9% between 2016 and 2018. The commercial office space vacancy rate in Aberdeen reached a historic high with 14.6% of available office space unoccupied in 2017, but has since fallen to 12% 2018. About 21% of the value of Scottish exports come from the north- east. However, the report warns of “fundamental challenges” in the likes of uncertainty over Brexit, an ageing population and the need to diversify the economy away from the dominant oil and gas industry. Among the recommendations made is the need to monitor progress, support new businesses and call for more devolution of powers to allow “flexibility”. Last June, the Press and Journal revealed that the three-strong panel would be given allowances – along with travel, recruitment and administration costs – expected to total between £60,000 and £80,000 a year. 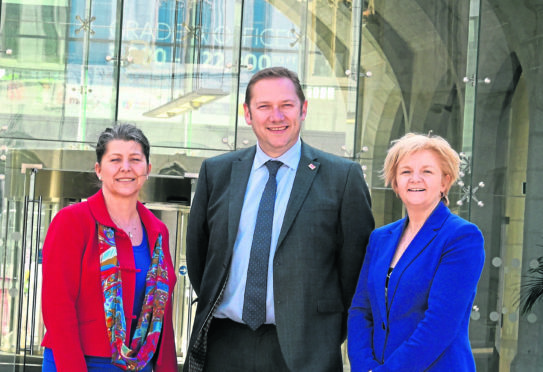 City council co-leader Jenny Laing said Aberdeen was already uniquely dependent on funding sources other than government grants – stating around half of the council’s funding came from business rates last year and pointed to the bond issue on the stock exchange. She told the conference the council would like to have full control over rates and the ability to set a “tourist tax”. Senator Lyndon Farnham, a minister for economic development, tourism, sport and culture for the Government of Jersey, also spoke at the event and said he saw similarities between the economies of the channel island and the Granite City. But the report wasn’t universally welcomed. Opposition SNP group leader Stephen Flynn said: “I can’t hide the fact that I am somewhat underwhelmed by the report given the financial outlay – much of what is detailed is already well known by those who live and work in the city. these risks and voted overwhelmingly to remain in the EU and I hope that the Tory Brexiteers running our council will reflect heavily on this.